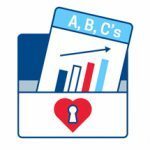 Entrepreneurship for Cardiovascular Health Opportunities (ECHO) is a specialized hands-on training program led by veteran entrepreneurs and consultants across a variety of sectors. 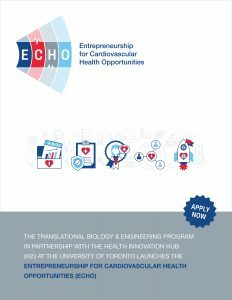 ECHO provides innovators of cardiovascular technologies with entrepreneurship training, mentorship, networking, and funding opportunities. 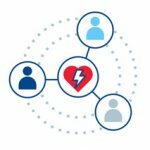 Translational Biology and Engineering Program (TBEP): The University of Toronto component of the Ted Rogers Centre for Heart Research, focused on heart failure research across the lifespan. Health Innovation Hub (H2i): A University of Toronto campus-linked accelerator facilitating the commercialization of health matters. Any Canadian-based student, researcher and/or entrepreneur developing advanced cardiovascular technologies and innovations is encouraged to apply! This is an ideal opportunity for researchers, postdoctoral fellows, clinical trainees and graduate students who are self-starters and want to refine their career path in a knowledge-based economy while retaining the opportunity to work in an innovation-based environment. Click here to visit our frequently asked questions page. Provide entrepreneurship training, mentorship, networking and funding opportunities for early ventures in the cardiovascular health sector. Aid in transferring research innovations and intellectual property from academic and hospital institutions into the economy. 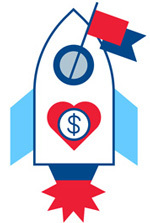 Create more start-ups in the cardiovascular health sector. The MaRS Entrepreneur’s Toolkit Workshops are a collection of experiential and hands-on workshops that are facilitated by veteran entrepreneurs. It targets such fundamental entrepreneurship principles as value proposition, business model, finance fundamentals, leadership, marketing and communication, sales strategy and pitching to investors. A series of interactive workshops focused on key subjects pivotal to the success of early stage start-ups in the health sector such as market research, corporate governance, intellectual property, regulatory strategy, clinical trials, quality systems, health technology assessment, procurement, funding and government resources, and investments, and partnerships. They are facilitated by academic, industry and government subject matter experts. A seminar series in which successful entrepreneurs and business leaders share their experiences in commercializing technologies in the cardiovascular health sector. Guest speakers include executives and founders of medical device, biotechnology and digital health companies. Successfully ranked ventures will become clients of the Health Innovation Hub (H2i) with access to: (1) H2i’s extensive network of industry, government and academic advisors; (2) peer-to-peer mentorship by start-up mentors selected from H2i’s venture portfolio; (3) professional funding; and (4) H2i events. The program will culminate with a pitch competition, where the program ventures will have the opportunity to win potential start-up funding from a $250,000 pool. There will also be opportunities for follow-on funding via our partners. 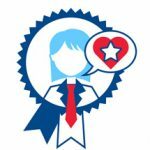 Any Canadian-based student, researcher and/or entrepreneur developing advanced cardiovascular technologies and innovations is eligible to apply. ECHO has limited space available, so candidates are encouraged to apply as early as possible. Complete the following two forms and submit by Friday August 24, 2018. 1) ECHO Application Form: submit via email to Soror Sharifpoor, TBEP research program manager. Interviews will commence September 2018 for select applicants. The program begins October 1, 2018. In February 2015, Canada’s “University Affairs” magazine reported that at the time of entry into their programs, 65 to 85% of new PhD graduates aspired to obtain tenured-track faculty members. One month earlier, the Conference Board of Canada reported that 60% of PhDs find employment in their area of PhD training expertise outside of academia. 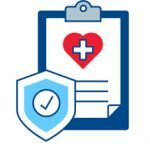 Maybe one of those areas for you is the creative and growing sector of health science entrepreneurship, creating products and services for the economic and health benefit of society.